Facebook, Twitter, Pinterest, and other social media sites may play an important role in how 2013’s Christmas shoppers find and buy presents on the Internet and in store, potentially making social a necessary marketing channel for merchants. While social media sites will probably generate just 2 percent of direct traffic to U.S. online stores this holiday season, 36 percent of consumers say they will use social media to help them make Christmas buying decisions, according to the Adobe Digital Index 2013 Online Shopping Forecast released this week. Social media, in effect, is a form of word-of-mouth marketing, and as marketing guru Jay Baer points out, word-of-mouth marketing is “inherently additive” to ecommerce conversion. In fact, there is good data that word-of-mouth marketing, including sharing on social sites, impacts 80 percent of all ecommerce purchases. Perhaps, Facebook introduced the shopper to a particular Internet store or Pinterest showed that shopper to a particular item, and then days, weeks, or even months later that engagement helped influence a purchase. It is not a matter when or if an online retailer should market on social media sites. The question is how to market. What follows are five tips for promoting your online store this year. Engagement and relationship are keys in any social media marketing strategy. Images may be the single best tool that ecommerce marketers have to build both. Using Facebook as an example another Adobe study, The Social Intelligence Report – Q3 2013, found that Likes produce 87 percent of all social engagement, and that images posted to a Facebook timeline generate 600 percent more Likes and other social engagements than text-based posts. Posts with pictures generate the best social response of any form of social media post. With this is in mind, use images frequently in social media marketing. You might show product images, product collages, or so-called lifestyle images on Pinterest, with Instagram, or on Facebook. 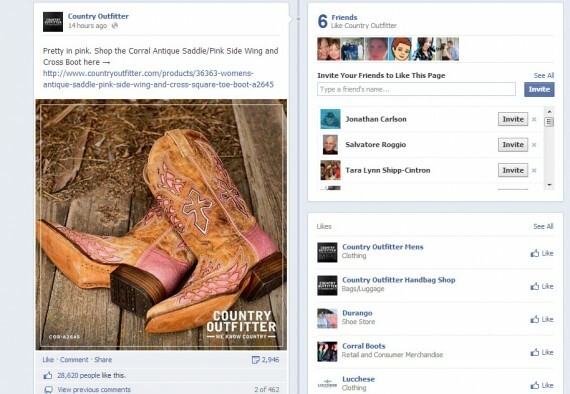 As an example, online retailer Country Outfitters generated more than 28,000 Likes on November 6 with picture of a pair of boots on a barn floor. These sorts of posts have the potential to boost holiday sales either through some amount of direct traffic or via exposure for your products, brand, and store. Country Outfitters generated more than 28,000 Likes from a photo post. In the social media context, videos generate engagement almost as well and images, and are less frequently posted, meaning that you may have fewer video-posting competitors. For your Christmas 2013 promotions, consider posting videos that answer common holiday questions or concerns. As an example, you might publish a video explaining Christmas shipping policies, including cutoff dates. Or a merchant could post a series of short videos showing holiday gift ideas for a particular age group or demographic. In terms of driving direct traffic to your ecommerce website, Twitter probably accounts for a tiny percentage of your site’s social driven sessions, but it is the fastest growing major social media platform in terms of referred visits, up 258 percent year-over-year, according to Adobe. By comparison, Facebook direct traffic referrals fell 20 percent for the same time period. For Christmas 2013, use Twitter as an extension of your customer service department. Encourage customer questions and respond quickly. Focus on posts that are helpful, not on posts aimed at making a sale. Customers who feel like your business is responsive and trustworthy are more willing to purchase from you. Writing in Forbes, Jayson DeMers, CEO of AudienceBloom, a content marketing firm, pointed out that Google+ is becoming more relevant on two fronts. Put simply, Google+ is a social media network that helps you engage potential customers and may help your business rank better on the world’s most popular search engine. Both cases — Google+ users and search engine optimization — could still have an impact on 2013 Christmas sales, particularly if you have both an online store and a brink-and-mortar shop. Try focusing on improving your business’s Google+ profile and posting useful or entertaining content — you don’t need to post the next viral video, you just need to be consistent. For most of your social media marketing, you’re going to focus on engagement, relationship building, and being helpful. Your aim is to take advantage of social’s word-of-mouth influence to ultimately encourage sales. But there is one place on social that you can go for direct traffic and sales: paid promotion or, as some marketers call it, paid social. Facebook, as an example, has seen click-through rates for its ads rise 275 percent year-over-year, according to Adobe. The platform is also offering both a cost-per-thousand and a pay-per-click model, giving marketers the opportunity to better optimize campaigns. For Christmas 2013 consider using a fair portion of your paid advertising budget on paid social. As with any paid marketing, monitor, measure, analyze, and optimize.